In every city, there exists one or more problematic locales, and Rankin Park (both a park and community pool) was at the top of the list for Martinez. The $10 million community resource sits atop a hill, secluded from view and has, since its construction, attracted criminal activities such as after-hours loitering and swimming, vandalism, petty theft and drugs. Martinez employed Odin to install a total of six cameras to monitor the area. 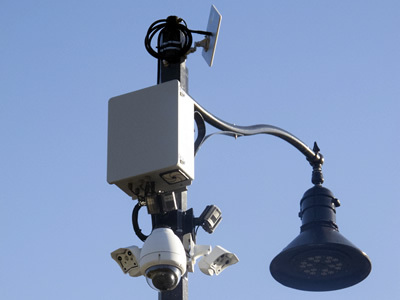 The system they implemented has a wide array of capabilities including the power to relay information via wireless networks and produce HD-grade pictures. The cameras are able to capture both daytime and challenging, low-light scenarios; pan and tilt over a wide range; and possess integrated microphone, speaker and motion detectors. Q: What was your main objective with the security system installation? EG: Because the park is off the beaten path, we wanted to increase its visibility with security cameras that would help us harden the target. We’ve always had problems here, but they were getting bigger – up to damages totaling in the five digits. We had to do something else. Being able to both identify illegal activity in real time and, in turn, cut the response time of dispatching officers were key components. Our strategy was to install cameras in those places where headlights, motion or any activity would occur so that it would then alert dispatch in real time. The camera angles are also calculated to view persons trying to scale the walls that enclose the pool. Q: How long have the cameras been in effect? Q: What has been the result? EG: Since the cameras were installed, to date, we’ve had zero damage. We have not had any incidences of vandalism since surveillance was installed – and May is usually a big month, crime-wise, in the park because it marks the start of summer. I’d like to think the drop in activity is because of the cameras. They are one of the greatest investments we’ve made. Q: How much did the surveillance system cost? Q: Are the Rankin Park security upgrades part of a larger safety campaign for Martinez? EG: The big picture for Martinez is to grow our network of public surveillance. We incorporated a second area that’s also under surveillance and there are still other locations that are important to us. We plan on expanding in the future. Q: Do you have any advice for other jurisdictions considering upgrading their surveillance, or to those that might benefit from this kind of system? EG: Do your research. Don’t get sold a bag of goods. Find a company that can deliver on what they promise. Other vendors quoted low prices but had no way to deliver what they proposed to us. We are very fortunate we chose Odin.